As you stretch gold into a strand one atom thick, an expressway for heat opens up. 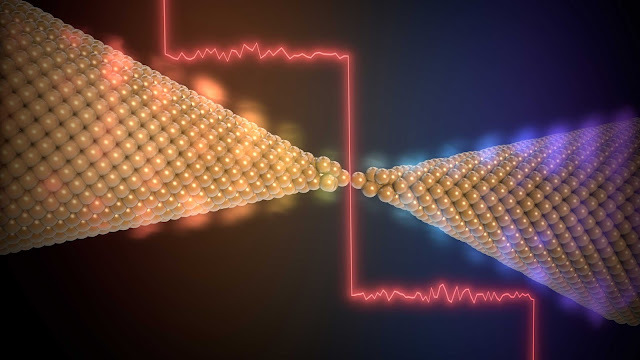 It's called a quantum of thermal conductance and University of Michigan researchers have observed this phenomenon for the first time at room temperature. They report their results in a study published online in the journal Science. An artistic representation of heat flow in a single atom junction. For more than two centuries, scientists and engineers have studied how heat flows. Joseph Fourier developed a law to describe heat transfer in matter in the early 1800s. Fourier's law plays a central role in heat transfer and classical physics and is useful in designing devices. Heat flow often needs to be enhanced as in the case of electronics, or reduced in thermoelectric devices for efficient conversion of heat to electricity. Fourier's law works well for macroscale devices but breaks down in single-atom-wide wires. "Instead of looking at bulk materials as Fourier did, we're looking at a nanoscale wire that is just one atom thick," said Longji Cui, a doctoral student in mechanical engineering and lead author of the study. "The question we asked is: How does heat flow when you go to the smallest possible dimensions?" "One-atom-wide wires, also called single-atom junctions, are akin to highways where, if the flow of heat is unimpeded, the heat flow rate reaches a value that is governed by only fundamental physical constants," said Wonho Jeong, a postdoctoral fellow in mechanical engineering and an equally contributing lead author of the study. While this heat flow behavior governed by quantum mechanics has been theorized, it had only been observed at ultra-cold temperatures. However, to create useful nanoscale systems, the effects need to be observed at room temperatures. Toward this goal, the U-M team developed picowatt-resolution heat flow sensors called "calorimeters" that were able to measure heat flows in single-atom strands of gold and platinum. The picowatt resolution they achieved is 100 times finer than their previous devices, enabling them to observe quantized heat flow properties in gold. "It took us years to improve the calorimeters to be sensitive enough and be properly integrated into the actual experiment," said Edgar Meyhofer, professor of mechanical engineering and a co-author of the study. An animation depicting atoms of gold stretched into a strand in which Michigan Engineering researchers detected a quantum of thermal conductance. A quantum of thermal conductance represents the largest possible heat flow through a channel in a material. You can think of the channel as a highway for the flow of heat. This was the first time such a channel was detected at room temperature. The calorimeter designers on the team—Jeong and Sunghoon Hur, a doctoral student in mechanical engineering—collaborated closely with their colleague, Cui, to iterate on the design and nanofabrication of the calorimeter and integrate it into a unique experimental setup. "Instead of quickly publishing, we needed to go back to the drawing board several times. Sometimes we would solve one problem but create two more. However, our strong collaborative efforts enabled us to overcome these challenges," said Hur, a co-author of the study. "Going forward, this work paves the way for probing the ultimate limits of energy and heat flow in a host of different materials, including atomic and molecular sized devices and organic molecules," said Pramod Reddy, professor of mechanical engineering and a co-author of the study. The work performed at the University of Michigan was funded by the Department of Energy (Basic Energy Sciences), Office of Naval Research and National Science Foundation.